In the late 1990s industrial dairy farms started squeezing out the small family farms. Craig sold his dairy farm in 2003, expanded the composting operation and brought in his firstborn son, Cody, to make it into a thriving business. They set up Full Circle Soils and Compost on a 40-acre plot at the Stewart Conservation Camp, part of the Northern Nevada Correctional Center. Six inmates work for the company. The camp also hosts an inmate-run dairy farm as well as a ranch for wild horses captured on BLM lands. Those horses and cows produce truck loads of manure and Craig knows exactly what to do with it. 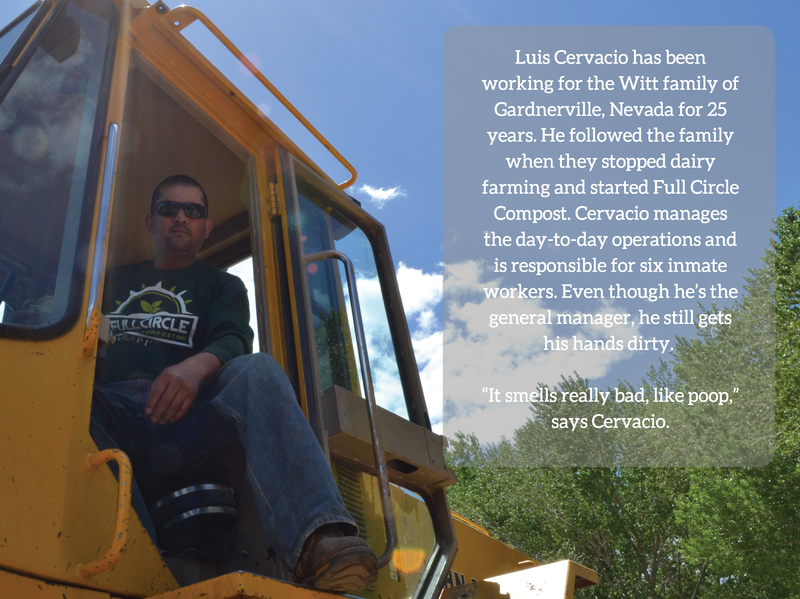 “When you’re in the compost business we look at piles of stuff that most people look at and go ugh…and we see opportunity,” he says. Cody turns that opportunity into partnerships with local businesses. In 2012, for example, the Atlantis Casino contracted with Waste Management and Full Circle to divert 1500 cubic yards of food scraps from the landfill to Full Circle. 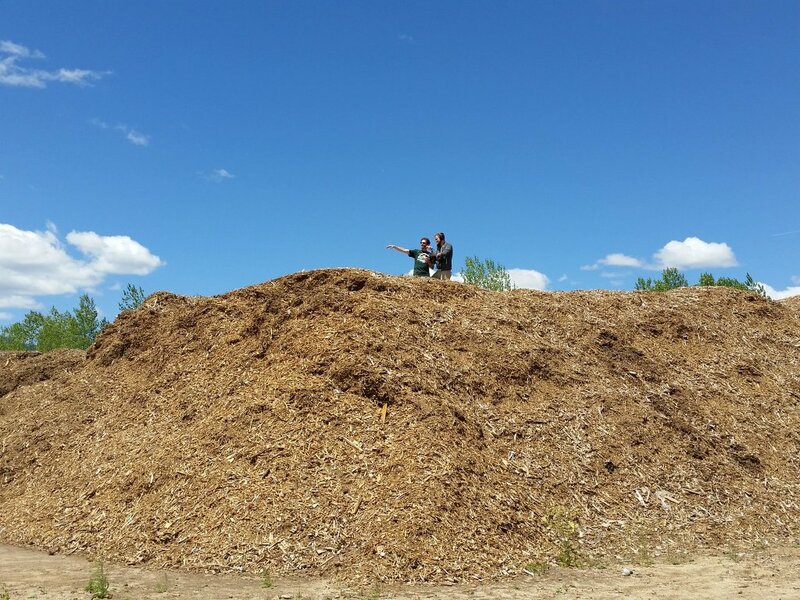 At the compost site scraps are ground up with grass clippings and wood chips from Tahoe residences and dumped into 400-yard windrows to decompose for 10 to 14 weeks. Craig concocted a unique compost recipe for Nevada’s desert soil. Medical marijuana growers discovered that his Soar potting mix was good for growing more than just tomatoes. “We recently sent two semi loads of our potting mix to Humboldt County [CA],” says Craig. Cody says the business is “triple bottom line,” meaning they are not looking solely at profit and loss but also at their effect on people and the environment. He says the goal is to change the soil so much that both commercial growers and home gardeners don’t need to buy the product any more. He admits it may not be the traditional business model. Farmer Craig has childlike enthusiasm for everything that grows, from the tiniest microbes to giant sequoias. He continues his search for the perfect recipe to produce big crops in Nevada. Craig remembers years ago his father told him, “You can’t grow tomatoes in Carson Valley.” So Craig planted four tomatoes at his father’s house. Later, he got a call asking what to do with all the tomatoes they produced. The greenhouse at the compost site is Craig’s laboratory. Beneath a moss covered blanket billions of worms create nutrient rich castings, which Craig mixes into his products. He is conducting experiments to see if quinoa and amaranth can grow in Nevada. His newest experiment is testing bat guano as a source of heavy organic nitrogen. Craig preaches his practice of soil mixology to northern Nevada high school kids. When they tell him that they hate tomatoes he says, “Shut up and taste home grown tomatoes.” He makes salsa out of fresh-picked ingredients and gives the students a taste. After every presentation Craig says he receives a letter saying ‘tomatoes are our favorite food’. Homegrown Compost Company Revitalizes Northern Nevada Gardens from Reynolds School of Journalism on Vimeo.